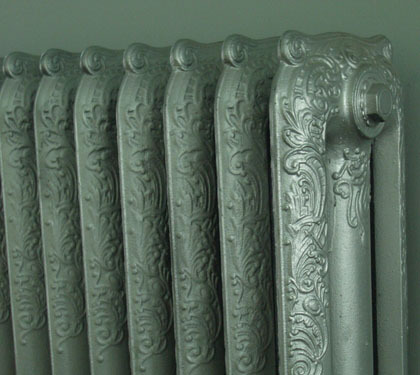 One of my favorite fall rituals is bleeding the radiators in our St. Paul house. I love everything about it—the little key that fits in the notch of the ornate radiators to let out the air, the red knob you turn to add more water to the system, the green overflow tank tucked under the basement stairs. I love checking the upstairs radiators and feeling the cold areas turn hot once you let the air out of the system. It’s a quaint old system and it suits our quaint old house. It’s a hands-off situation for us here in Berlin. Wolfgang, a German heater repair guy, was just at our flat, draining the water and getting the system ready for the season. He carried his equipment up the three flights of stairs, put on an apron, and set about his work in the kitchen, where the boiler is mounted on the wall. Meanwhile, as the march toward winter is synchronized between Berlin and St. Paul, a boiler maintenance guy paid a visit to our house back at home. But while Wolfgang found everything up to snuff and ready for our use here, things are not looking so good back home. Our quaint old boiler is on its last legs. Then again it has been for years and yet has been working fine for the ten years we’ve been in the house. Last spring on one of the final cold days it suddenly gave a thundering clanging when the heat tried to come on. We were told there was just air in the system, and not to worry about it. So we didn’t. But the first cold day of fall, when our renters tried to turn on the heat, the clanging returned and wouldn’t stop. It wasn’t air in the system at all; it was a broken circulator pump. Now M does a lot of things around the house, like cook fabulous meals and play beautiful piano, but if a problem arises having anything to do with clanging boilers, storm windows, the peeling garage, the grass or garden, it falls to me. I get to deal with all spiders and mice, too. This started early in our marriage and continues to this day. So when we got the email from the renters about the heat not working, even though this would be a long-distance job, it quickly fell into my purview. So. I am getting a little education about boilers. I am also getting a reminder about the merits of seeking multiple bids. I am learning that there are relatively new energy-efficient boilers. And then there are the Old Ironsides of boilers. There are the young technicians who know what you want to hear about making sustainable choices, saving gas and saving money. They’ll give you eight choices of boilers that range in price by energy-efficiency and number of years of warranty. And by the way, your current boiler from the 1970s is far larger than you need for this house. And I can’t fix your circulating pump even if I wanted to because your chimney liner isn’t up to code. Okay, grandpa, you’re hired. And it doesn’t hurt that your boiler will cost us a quarter of what the other guys were charging. Meanwhile we’re not turning on our Berlin heat until our St. Paul boiler is fixed. Because that’s the kind of landlords we are. This entry was posted in Sabbatical and tagged Berlin, boiler, heating, maintenance, radiator, St. Paul on October 3, 2013 by Jill M..